Image courtesy of Saw&#8209;Wai Hla and Kendal Clark, Ohio University. Scientists have discovered the world's smallest superconductor, a sheet of four pairs of molecules less than one nanometer wide. The Ohio University-led study, published Sunday as an advance online publication in the journal Nature Nanotechnology, provides the first evidence that nanoscale molecular superconducting wires can be fabricated, which could be used for nanoscale electronic devices and energy applications. 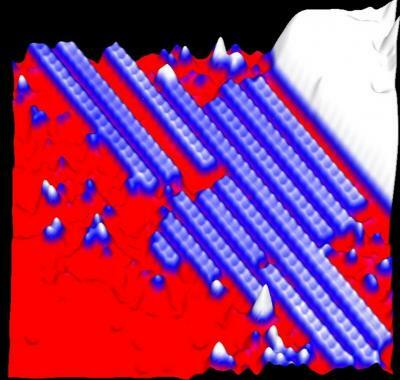 "Researchers have said that it's almost impossible to make nanoscale interconnects using metallic conductors because the resistance increases as the size of wire becomes smaller. 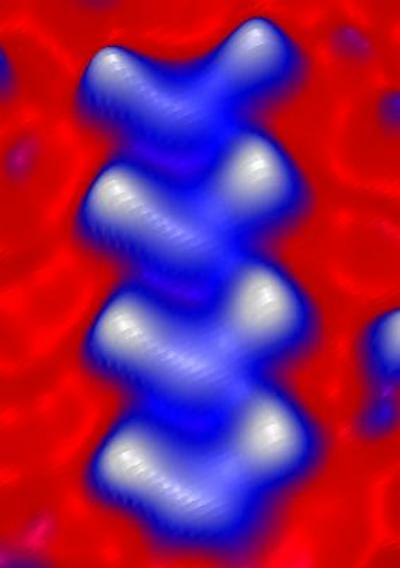 The nanowires become so hot that they can melt and destruct. That issue, Joule heating, has been a major barrier for making nanoscale devices a reality," said lead author Saw-Wai Hla, an associate professor of physics and astronomy with Ohio University's Nanoscale and Quantum Phenomena Institute.